This is a general onboarding guide whose main purpose is to help people who want to develop Raiden. It provides an explanation of the protocol followed by an explanation of the architecture. For information on coding style, commit rules and other development rules please refer to the Contributing Guide. In this section we will have the general explanation of how the Raiden protocol works, starting from the smart contracts and ending with the offchain messages that are exchanged between Raiden nodes. For a quick overview, please watch the video “Raiden Network Protocol Explained”. For a more formal definition of the protocol please refer to the specification. Raiden has 4 smart contracts that are needed to support the protocol. They can all be found at the smart contracts repository. The repository also contains scripts to deploy and verify the contracts on different networks. For more information on the contracts and the channel lifecycle check the smart contract specification. Let’s first look at the messages exchanged in the happy path of a Raiden Transfer. Each Transfer has an Initiator, a Target and zero or more Mediators. The Initiator creates a Locked Transfer message and propagates it to the Target through multiple Mediators. A LockedTransfer message reserves the amount for the pending payment in each channel between Initiator/Mediator and Mediator/Target. Once the LockedTransfer reaches the Target then they request the secret from the Initiator by sending a Secret Request message. When the Initiator receives the SecretRequest message, the Initiator can safely assume that a mediated locked transfer with the required amount has arrived to the Target, since Target as a payment receiver has all the incentives to be honest. When the Initiator gets the secret request message, they check to make sure that it’s a valid one and that it corresponds to a locked transfer that they sent out. If all checks out they send a Reveal Secret message back to the Target. The RevealSecret message contains a secret that allows each Mediator or the Target along the path to claim the locked amount in the pending transfer. The Target will process the secret message, register it into their state and then proceed to reveal the secret backwards by sending their own RevealSecret message to their counterparty. The counterparty which can either be a Mediator or the Initiator will receive this RevealSecret message and process it. This message tells them that the payee (either the target or another mediator if we got multiple hops) knows the secret and wants to claim the lock off-chain. So then they may unlock the lock and send an up-to date balance proof to the payee. This is done by sending what we (unfortunately) call the Secret message back to the partner who sent the Reveal Secret. This concludes the transfer for that hop. If the receiver of RevealSecret was the Initiator then the transfer is finished end-to-end. If it was just a Mediator then they will have to propagate the transfer backwards by sending a RevealSecret message backwards to their partner repeating the procedure outlined above. Looking at a similar network topology as shown in the happy case above, let’s see how the protocol behaves when something goes wrong and our partner does not follow the protocol. If the amount involved in the token is really small then the payee can just do nothing and forfeit it. If the amount is worth an on-chain transaction then the payee can go on-chain by registering the secret on the SecretRegistry contract and prove he knew the secret before the block of the lock expiration. From that point on the protocol can continue as before but now the secret is visible onchain so everyone along the path now knows it. If for some reason the protocol does not proceed and the Target never requests for the secret then the pending transfer lock will at some point expire. At the point of expiration in a payer-payee channel the payer will have to notify the payee that the lock has expired by sending a LockExpired message. The payee receives the LockExpired message, removes the lock from its pending locks for the partner and updates the state with the new balance proof. At the moment routing in Raiden works in a very simple manner. Each node has a global view of the network knowing the initial capacity of each channel by watching for the deposit events happening on chain. As a result each node keeps a graph of the network but that graph may be outdated due to the capacity changing because of offchain transfers. Each node tries to forward the transfer through the shortest path with enough capacity to the target. If at some poin the transfer can’t go through due to the actual capacity not being sufficient or due to the node being offline then a special kind of LockedTransfer called a Refund Transfer will be sent back to the payer, effectively refunding him the transferred amount and allowing him to try another route. This is repeated until either a route is found or we have no other ways to reach the target at which case the Transfer fails. If the transfer reaches the target and the protocol is followed properly as we saw in the happy transfer case above then all the pending transfers in the path will be unlocked and the node balances will be updated. When a node mediates transfers all of the locks are kept on the state of the mediator node inside a merkle tree. For each new transfer the lock is appended to the merkle tree. If the protocol is followed as shown in the happy transfer case above then the corresponding lock is unlocked and removed from the merkle tree. At this section we are going to look in more detail how the unlocking of pending transfers mentioned in the previous section works. Continuing from the example seen in the pending transfers section above let’s explore what happens when B’s partner closes the channel while there are transfers pending. For the payment A->B->C , C follows the protocol and send the secret back to B. At the same time A closes the channel and so the normal offchain protocol can not be followed. Instead we enter the channel settlement lifecycle lifecycle we saw in the previous section with A closing the channel with what he received from his partner B. Now B has to register the secret received by C onchain as he can no longer do it offchain. He has to prove that he knew the secret at a block height before the pending transfer’s expiration. He does that by calling registerSecret on the SecretRegistry contract. Now it’s B’s turn to update the contract with what he has received from A. He will provide a hash of the merkle root, the transferred amount and the locked amount to the contract via the updateNonclosingbalanceproof call. After both are done and the settlement period has passed then anyone can settle the channel and send the tokens amounts owed to A and B respectively back to its owners. After settlement whoever has pending transfers that need to be unlocked on chain has to unlock them onchain. In this example B will provide the merkle tree to the contract via the unlock function. That will result in the contract checking each one of the locks and send the locked tokens for which the secret was registered on time to the intended receiver (B) and those for which it wasn’t back to the payer (A). In this section we are going to see an explanation of how the code of the Raiden client is structured and how it implements the protocol detailed in the previous section and. 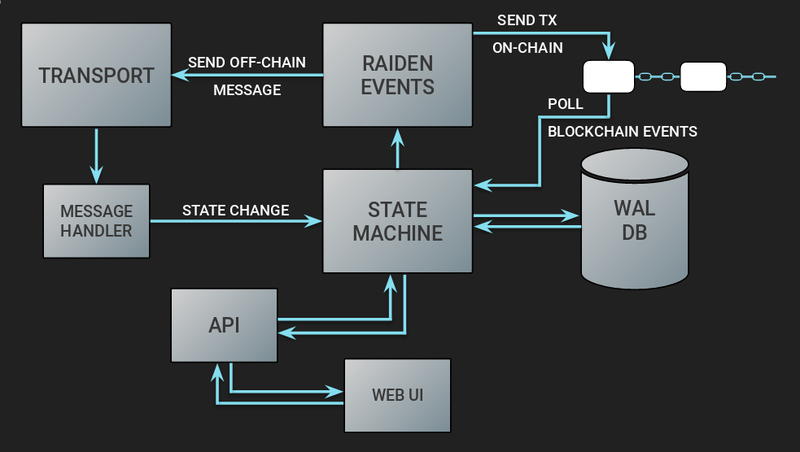 At the core of the Raiden architecture lies a state machine. The state machine gets fed state changes from various sources. Action* state changes are caused by user commands directly from the user through the REST API. ContractReceive* state changes are caused by blockchain events fetched via polling. Receive* state changes are caused by receiving an offchain message. All these state changes are processed along with the current state and produce a new state along with something that we call the “Raiden Internal Events” which is essentially I/O since the state machine can’t do I/O on its own. Processing those raiden internal events performs all kinds of I/O. Send* events send offchain messages. ContractSend* events send onchain transactions. Event* events cause node events (for example, logging a debug message). The entire state machine code is located under the transfer directory. For a good overview of all the classes used in the state machine check the architecture file. The StateManager class is where the application state is stored. Also at the dispatch() function is where the state changes are applied to the current state through the state transition function and produce the next state and a list of Raiden Internal events. The result of the application of a state change is represented by the TransitionResult class. It is essentially a tuple containing the new state and a list of Raiden internal events produced by the state transition. The state in Raiden is kept in a hierarchical manner in what we call “Tasks”. 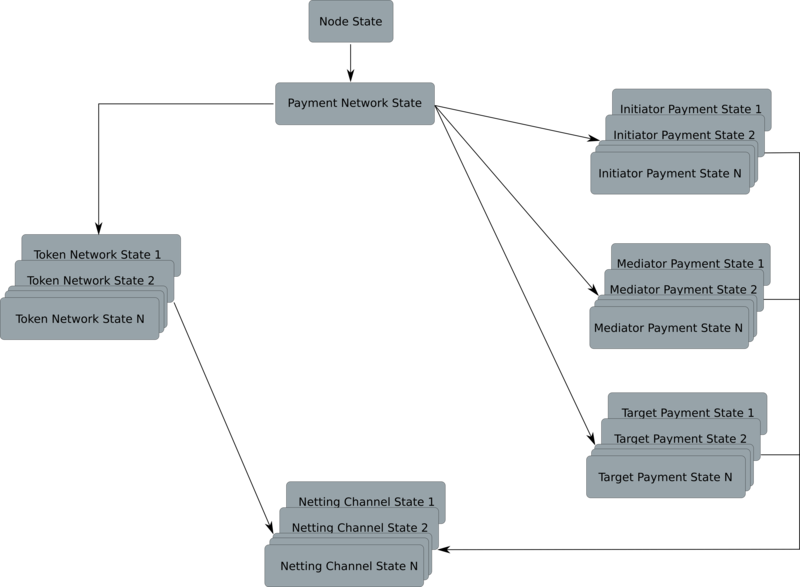 At the top is the node state represented by the ChainState class. Whenever a node starts up the first state change we get is the ActionInitChain state change and through its application we get the aforementioned Chain State. All state changes first pass through this level via the node state transition function. When we start we also create a new PaymentNetwork state corresponding to the default Token Network Registry contract. In the future there could be multiple token network registries but at the moment we only register the default. Whenever we get a blockchain event denoting that a new Token Network was created then an ActionNewTokenNetwork state change is created. Processing that state change a TokenNetworkState is added to the PaymentNetworkState. All state changes that need to go down to the TokenNetwork are eventually subdispatched from the node state to the Token Network’s state transition function. ChannelOpened is a blockchain event denoting that a new channel was opened. Whenever we receive ChannelOpened and we are a participant, a ContractReceiveChannelNew state change is generated and sent into the state machine. The state change contains the channel’s NettingChannelState. When the state change is processed, the NettingChannelState is added into the corresponding TokenNetworkState. From this point on all state changes that concern a specific channel are subdispatched from the TokenNetwork processing to the channel’s state transition function. All the state related to mediated transfers is kept under the transfer/mediated_transfer directory. If our node initiates a transfer then it takes on the role of the Initiator and an ActionInitInitiator state change is generated. Then it’s subdispatched to the initiator manager’s state transition where a new InitiatorPaymentState task will be created. From now on all state changes that affect this transfer will be subdispatched to this Initiator task. If our node mediated a transfer then it takes on the role of the mediator and an ActionInitMediator state change is generated. Then it’s subdispatched to the mediator’s state transition function where a new MediatorTransferState task will be created. From now on all state changes that affect this transfer will be subdispatched to this Mediator Task. Finally if our node receives a transfer whose intended recipient is the node itself then it takes on the role of the target and an ActionInitTarget state change is generated. Then it’s subdispatched to the target’s state transition function where a new TargetTransferState task will be created. From now on all state changes that affect this transfer will be subdispatched to this Target Task. As mentioned before all state transitions may generate a list of Raiden Events. Since the state machine itself can have no side effects or I/O these events act as a trigger for all side effects. After a state change has been processed we get the event list. For each of these events we invoke the RaidenEventHandler which will process the events and trigger the appropriate side effects. For example send a locked transfer or settle a channel if the settlement period has ended. 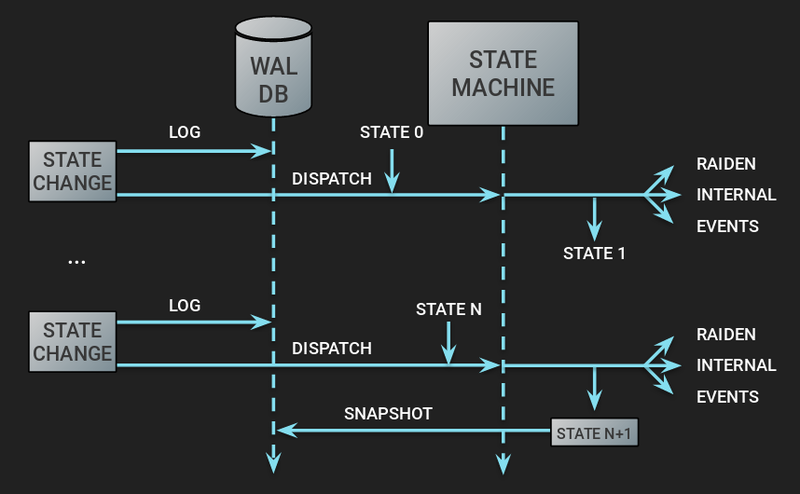 Before a state change is dispatched to the state machine for processing we write it into a Database called the Write Ahead Log. This allows Raiden to be persistent in case of crashes or other forms of irregular shutdown. All that is needed in order to recreate the latest state is the initial state and the sum of state changes that lead up to it. So during a restart we read all the state changes in the WAL and replay them to recreate the latest state. If Raiden has been running for many days then a lot of state changes will have gathered. Replaying all of these state changes at restart would take a lot of time so as an optimization at regular internals we are taking a snapshot of the current state. Subsequently at restart we restore the snapshotted state, retrieve the state changes since the snapshots and replay only those state changes to get to the final state. The Raiden Transport layer is responsible for the receiving and sending of the off-chain messages. The current architecture allows for a pluggable transport layer through the use of a common transport interface. We have two implementation of this interface. The deprecated UDPTransport and the MatrixTransport. Irrespective of the transport layer once a message is received it will eventually be forwarded to the MessageHandler which will generate the proper state changes and dispatch them to the state machine described in the previous section. The reasoning behind the choice of Matrix as a transport layer for Raiden is nicely explained in this blogpost. In this section we are going to only look over the main points in the code which are the entries to the transport layer. For more information please check out the matrix transport spec. In Matrix each user has a userid in the form of @<userId>:<homeserver_uri>. userId is the lowercased ethereum address of the node, possibly followed by a 4-bytes hex-encoded random suffix, separated from the address by a dot. The homeserver_uri is the URI of the matrix homeserver at which the user registers. For each partner we interact with a specific room is created on the matrix home server between us and our partner. The _handle_message() function is the entry point to any messages received in such a room and after some validation it is forwarded to _receive_message() which will finally forward to the message handler. As for sending messages to a partner in a channel the send_async() function is the entry point. It essentially populates the sending queue for the partner. The actual messages will be sent from the queue during the main loop of the transport through the _check_and_send() function. All the messages seen in the offchain messages section need to be (1) seen and (2) succesfully processed by the partner node. To facilitate synchronization of that fact the transport layer makes sure that all messages except for Delivered itself cause a Delivered to be sent. The Delivered message is sent right when the transport receives a message and before processing. It just tells the sender that the message was received and will be processed. Succesfully handling a valid unlock (aka Secret) message at both target and mediator. Receiving a Delivered is enough to remove them from the queue triggering the transport to stop retrying sending them. On the sender’s side for the specific queues they’ll wait for the Processed message, signaling not only that the message was delivered, but also that the processing of the respective state change occurred successfully, or else keep retrying. If a Processed is received the the specific queue is cleared. <- B receives it and sends Delivered(123). <- B accepts it (i.e. succesfully processes it). Then sends Processed(123) and starts a retry loop for it. -> A receives Delivered(123). Stops retry loop for any message_id=123 from B in its global queue, which is none, so it effectivelly skips it. -> A receives Processed(123), stops retry loop for any message_id=123 from B in its specific queue (in this case, LockedTransfer), sends Delivered(123) in reply to Processed(123). <- B receives Delivered(123), stops retry loop for any message_id=123 from A in its global queue (in this case, Processed). We communicate with the blockchain through the JSONRPCClient class. That class is a wrapper of web3.py for all blockchain JSON RPC calls and also checks that the underlying ethereum client is compatible with Raiden. Checks things such as that all required interfaces are enabled and that the version is high enough (Byzantium enabled). We communicate with each smart contract through the notion of a smart contract proxy. Each proxy is a essentially a class exposing the functionality of a specific contract using the JSONRPCClient. PaymentChannel - This is just a wrapper of the token network functions for a specific channel. All the events that happen onchain are polled after a new block is received and all found events are forwarded to the blockchain event handler. From there each different event is processed and appropriate state changes are generated and dispatched to the state machine to be processed by it as we saw before. As mentioned before a byproduct of state transitions in the state machine are Raiden Internal events. A certain subset of those events, the ContractSendEvent is what allows us to send on chain transactions. As seen in the Raiden Internal Events section if a ContractSendXXX event is sent to the RaidenEventHandler then it will be processed and eventually the appropriate proxy will generate an onchain transaction. All Raiden user facing actions are exposed via a REST API. For a full documentation of the endpoints check the REST API documentation. As far as the code is concerned all of the functionality to interact with Raiden is inside what we call the Python API. The RaidenAPI class has all the functions which deal with channel operations, transfers e.t.c. These functions are exposed to the user through the REST API endpoints of the RestAPI class. TODO: Small overview of code architecture for the WebUI. These are smart contracts to be deployed in the future. See Monitoring Service and Pathfinding Service in the smart contract specification. The messages specification should describe the message formats. On the implementation side, the messages file contains the details. See encode() method of Message class, and packed() method of each subclass of Message. Ultimately the byte sequence of the packed messages is defined in the encoding/messages file. Why does updateNonClosingBalanceProof() require one more signatures than closeChannel()? The two functions authenticate the beneficiary of the balance proof in different ways. closeChannel() uses msg.sender while updateNonClosingBalanceProof() checks the non_closing_signature argument. This allows a delegate (like Monitoring Services) to call updateNonClosingBalanceProof(), which has to be called during a limited challenge period. Why do closeChannel() and updateNonClosingBalanceProof() authenticate both parties of the channel? The authors of the balance proofs control their tokens, so their signatures must be checked. The receiver’s signatures must be checked because they should be able to refuse balance proofs. For example, when the transferred amount decreases in a newer balance proof, the receiver can choose not to add the second signature on the balance proof. Why are balance hashes used in closeChannel() and updateNonClosingBalanceProof() instead of plain balance proofs? For privacy reasons. If updateNonClosingBalanceProof() required plain balance proofs, actual token amounts would be visible in all balance proofs sent to Monitoring Services. The Monitoring Services and eavesdroppers would learn a lot about transfer patterns of each user.